Need at least two people to help with the Manage A Trios achievement. It's to complete 5 quest with 3 co op partners. I'll be happy to help out. Let me know when you'd like to tackle it. I will join...let me know when. Been waiting to start this and now is a good time. My characters will be new so can be any of them....and easy quests. Could we possibly get the 4 player different character achievements too please? @Ms Dudette wrote: I will join...let me know when. Been waiting to start this and now is a good time. I haven't played the game either. Therefore all my characters will be new and I can use any of them. I got all four on my tag and she has the oriental women so we should be good. So as long as neither have her we should be good. 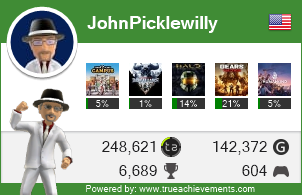 @mrtnmitchell wrote: Need at least two people to help with the Manage A Trios achievement. It's to complete 5 quest with 3 co op partners. Please stay min 15 minutes for the other achievement...People Person...play with 10 different co-op partners for at least 15 minutes each. We need a fourth right? If you need only two to join you, @Ms Dudette and I are willing to help out. Just let us know when you'd like to do this. Figured we could work out a evening tonight that good for us all it won't take long. No we have me JP Dudette and zombiesneedhugs so we are good. Ok set up a day and time. Maybe a quick session following one of the Mon or Fri sessions? I can make arrangements for most any time. We where talking maybe like 30 minutes before Monday's session shouldn't take long or Friday I'm good either way. Ok so I was thinking we should probably do this like a day we don't have a session since I think it will take more then 30 minutes to do this. I agree might take more than 30 minutes. Whenever your friend and JPW can make it. I am good any evening. I have several ready to turn in...this will help toward 25 quests in co op. Maybe possibly do the co op arena....idk how long 30 waves would take tho...probably too long. Sorry I've taken so long to get back to y'all. My work schedule has changed and my gaming time has been drastically reduced. What do I need (other than the time) to make this happen. Do I just need to start up any or all of the characters? Do I need to have any quests ready to turn in? I believe you need to at least have made it to the beach. Which is solo play. If it’s just the 3 of us for Friday’s session, we could do this instead? Sounds like a plan to me and yes yo u have to make it to the beach by yourself. @Ms Dudette wrote: I believe you need to at least have made it to the beach. Which is solo play. I like that idea (playing Friday). I will start up some characters and get them to the beach. I have four characters that completed the Prologue and are waiting in the bungalow on the beach. I'm looking forward to it. Well if it don't work out for us on Friday we will pick a day and go with that. The early missions are pretty easy so we should be able to knock this out. Hey thanks a bunch you all I know it was difficult getting connected at first but we did it. Let me know when you do the arena and I will help out.